The simplest way to read the documents is to select the PDF editions where available. For the Old Testament / Tanakh, the Hebrew is in HTML/Unicode and should render well on a modern computer. 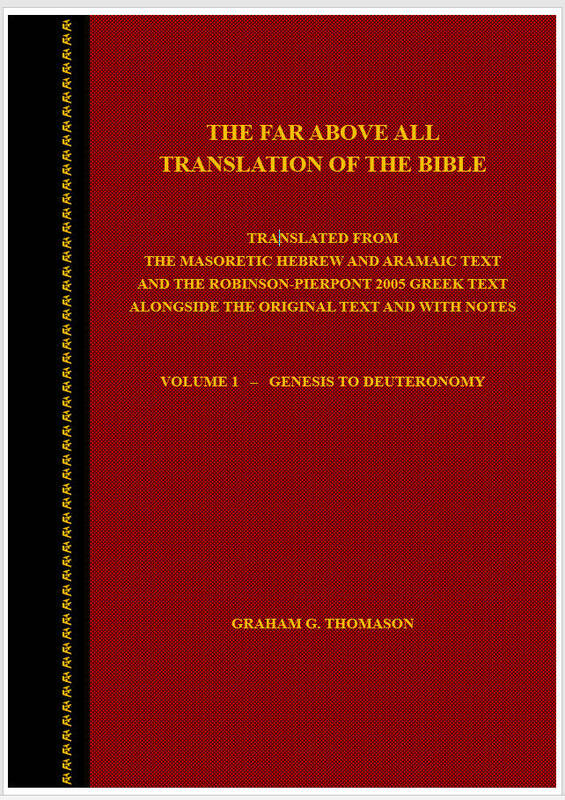 For the New Testament, there is an all-in-one document in HTML/Unicode which should render well on a modern computer (derived from the native font file). The files are all less than 2.5 MB in size unless otherwise indicated. For more details, see the notes below. These documents are fairly stable, except that the Introduction to the OT is in progress and the Introduction to the NT may be simplified. These files are becoming stable. Corrigenda for the next upload: TXT. The file we most hope to see published as a book is the ALL-IN-ONE (Native font, AV book order) file (in bold print below). In the event of minor updates, we will ensure this file is up-to-date, whereas others are not regenerated for every update. The file requires our GGTEphesian font (see Fonts on the main menu). These files are draft, but Genesis-Isaiah are more stable. The file we most hope to see published as a book is the Hebrew English and Notes All Books, AV Order and Numbering file (in bold print below). In the event of minor updates, we will ensure this file is up-to-date, whereas others are not regenerated for every update. OT - NT Cross references in WLC order. Best viewed in landscape mode with the GGTEphesian font installed (see fonts page). Be aware that if an OT verse is quoted in several NT places, or an NT verse is quotes several OT verses, any one OT-NT pair may only show a partial correspondence. Quotations are sometimes adapted somewhat, or are better regarded as allusions, especially in the Book of Revelation. NT - OT Cross references in AV order. Parallel verses of the OT / Tanakh, side by side. Be aware that if verse A is parallel to verse B, and verse B is parallel to verse C, it does not necessarily follow that verse A is parallel to verse C (non-transitivity), because the parallelisms may be based on different parts of verse B. These are largely taken from Deuterographs by R. B. Girdlestone. The PDF files have rendered quite well, but some table rows break across pages. (This is because the css page-break-inside: avoid property is not supported in the author's best browser for printing). To view the DOCX files, you need to install the GGTEphesian and GGTAmos2 fonts. To view native-font NT HTML files, you need to install the GGTEphesian font. These fonts are obtainable from our fonts download page. To view the HTML, Firefox or Google's Chrome and Internet Explorer v.9 are fine - but not Internet Explorer v.8 - it does not handle our fonts properly, though you will still be able to read the English. If you want to save the HTML of the translation on your computer, don't forget to save the style sheet in the same directory as well. If you want to make your own PDF from the HTML, we suggest using PDFCreator and to print from Firefox. If you print these translations, please be aware that they are subject to change and correction, as reviews are made. In order for you to see changes that have been made between versions, and mark them up, we suggest you save the HTML of the version you download, (even if you are using the pdf), and use a differencing tool such as ExamDiff (free) or ExamDiffPro (not free) from Prestosoft.